Posted on April 5, 2012 by David H.
Some things last, some things don’t. A tree like an oak, or a Sophora, or an elm that’s survived Dutch elm disease, these might last for decades, or even into centuries. A wetland, however, and its concomitant plants, is very often a consistency of change, and this is especially true of the kind of wetland found in the lower areas of Philadelphia – as a stream winds and moves itself through the sand and gravel of the coastal plain, as the ebb and flow of the tides moves the soil here and there, as storms come and go, these wetlands change and shift, perpetually, as they always have. They can also, especially if they are broad and flat, as many wetlands tend to be, get built upon. If this happens, if a wetland is gone and built on, it can be difficult if not impossible to reconstruct just where it was, or what it looked like, or what grew there. But this, sometimes, can be done. There has been an ongoing effort in Pennsylvania to document the plants of this state, and this effort has led to collections of plants from across PA, and publications based on those collections (including the Plants of Pennsylvania by Ann Rhoads and Tim Block, now in its second edition), and to a database listing these collections – the Pennsylvania Flora Database. In this database are thousands of plant records for Philadelphia, including one for Chrysosplenium americanum, the American golden saxifrage. This collection was made by Bayard Long on the 1st of January, 1951, in East Oak Lane, near 2d St and 65th Ave. Bayard Long was a botanist who worked at the Academy of Natural Sciences for about 50 years, up until the early 1960s, though he never took a paycheck – he was independently wealthy, loved plants, and devoted his time to learning about them, to studying them, to writing about them, and to collecting them. He was extraordinarily well regarded – Merritt Fernald, botanist at Harvard University and author of the last two editions of Gray’s Manual of Botany (which was the guide to the plants of northeastern North America for most of the 20th century), considered Long a colleague. Bayard Long’s expertise was well known to anyone who worked on or was interested in the botany of North America at the time, and it still is. And Bayard Long, on new years day, 1951, went to collect plants in North Philadelphia. He collected this little plant, Chrysosplenium americanum, and documented it. This species is a smallish plant, maybe a few inches high, with greenish flowers generally less than a quarter inch across that bloom in spring to early summer – it grows in shady, muddy areas, and would be walked over, if walked by at all, by most people. And Bayard Long collected it on a winter day, the first winter day of 1951. And 60 years later, I found out about it, as I looked through the Philadelphia county records of the Pennsylvania Flora Database. This plant, the American golden saxifrage, is an obligate wetland plant – it is a plant that is not found in drier, upland areas, but is only found in areas regularly inundated with water. This is where it needs to live, and so we know that if it was growing at 2d and 65th, and we do know that it was, then there was a wetland there. And so I wondered where Bayard Long collected it, where was the wetland that he went to on that cold day in January, over half a century before? I thought at first it might have been at the Oak Lane Reservoir, between 3d and 5th Streets and between 65th and Chelten Avenues. Perhaps there had been a wet area associated with the reservoir, a seep perhaps, or a bank or a bit of overflow, where the American golden saxifrage could’ve taken hold. And, perhaps, 2d Street and 65th Avenue was just the closest street crossing, or where he’d started collecting that day, and so that was what was written down as the locality data. But Bayard Long was precise, and he was accurate. If he had collected it at the reservoir, he would have written that he had collected it at the reservoir. So that wasn’t it. And so there had to be a wetland very close to or right at 2d and 65th – and there was. If you look at the G. W. Bromley map of Philadelphia from 1910, you’ll see two streams reaching around, encircling 2d and 65th, and inbetween them, inbetween those streams, would have been a wetland – habitat for this obligate wetland plant. And so the first thing I wondered about, what it looked like, is in part answered. There was a wooded area there, as we can see from the background, and so the entire area wasn’t always flooded. This is also evidenced by the people standing there – none of them are wearing heavy boots and so the meadow they’re in most likely wasn’t flooded at least at the time this photograph was taken. But late June is a bit past the time to get spring floods, and so while this area was not a wet meadow in the summertime, it may well have gotten wet in the earlier springtime. And even though right then and there it was reasonably dry, we know from the old 1910 map that there were streams running nearby and we know from that old plant collection of Bayard Long’s that there was a wetland there into the early fifties. And so the second thing I wonder about is if the high school’s basement floods. Because flowing beneath this school, below the buildings, are streams, as flow beneath many sites in Philadelphia. Packed away, covered from the daylight, they still flow beneath the city as sewers, or seeping through the ground. Through pipes and through dirt, the water still runs, it still moves – and when that water moves, those ancient streams will flow, and when they flow, they will flow, and the water will wander where ever it will, even into a Catholic school’s basement, if there are cracks or holes in the walls or the floors, which there may well be. Cardinal Dougherty High School is now closed. It’s last class was graduated in 2010. The buildings still remain, but the school is no more – it no longer is what it once was, and it no longer does what it once did. This was a wetland sixty years ago, and then it was a school for decades, and it will be something else next. But things will get left behind as evidence of what was here, or perhaps they won’t. Things change, but often some things stay. 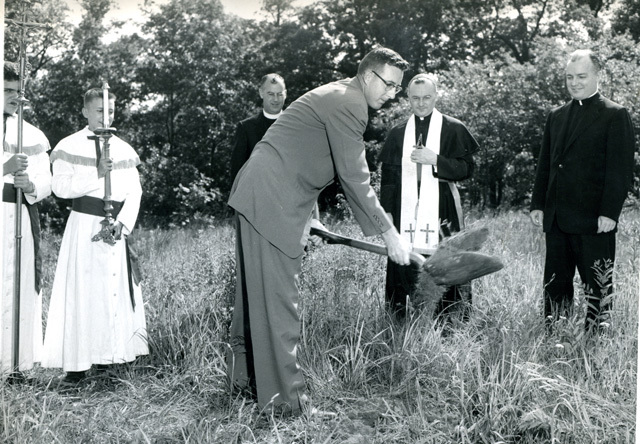 Even though the wetland where Cardinal Dougherty’s buildings now stand is itself now gone, a memento of it remains, in the Chrysosplenium americanum that Bayard Long collected in 1951. And so we know what was here, because someone kept it. There are other wetland plants with histories in Philadelphia – plants such as Micranthemum micranthemoides, Aeschynomene virginica, Zizania aquatica, Sagittaria latifolia (also known under a former name, engelmannia) – all of them tracking historic wetlands that are no longer there, or if they are there, they are changed from how they were in the past. We can still, sometimes, track back to see how they were, to see where the water flowed above and saturated into the ground, and maybe even to find a picture to see what they looked like, back then. But like everything, those wetlands are no longer as they were. However, we can still piece together these little puzzles to think about what they once might have been when they were assembled so differently than they are today. 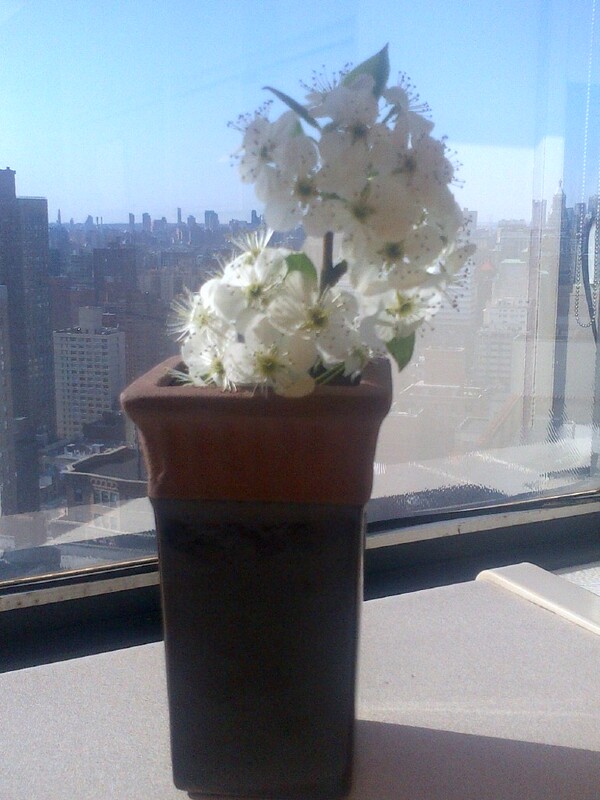 Posted on March 24, 2012 by David H.
There are white flowers blooming all over Philadelphia now. Some of them belong to the Amelanchier, also called shadbush, or serviceberry. Some of those white flowers are magnolias. Some are cherries, and there are others, too, but most of the ones that you’ll see at around this time are the blooms of the Callery pear (Pyrus calleryana), with their copious flush of white and their peculiar acrid smell. If you look closely at them, one thing that you’ll notice is that nearly every set of flowers is accompanied by its own set of leaves. Look closely, and poke around in the inflorescence (a cluster of flowers, that is) and you’ll see that each individual flower is connected to a little stem, in a somewhat spiral arrangement, winding down the axis, or winding up it, depending on which direction you go. Each one of those flowers is accompanied by a little tiny leaf, or a leaf scar to show where a leaf once was – each one repeats the other, in modular form, winding around the stem, up and down the line. Except all the way down the line. At the lowermost position on the inflorescence, the one closest to main part of the tree, there is almost always a set of a leaves, a little tuft of green, instead of a flower. Why are those leaves there and what are they doing? It could be that they provide a local food source for those flowers, early on in their development – those photosynthesizing leaves harvesting energy from the sun and gathering carbon dioxide from the atmosphere, twisting the two into sugar, and shipping that sugar right to the nearby flowers, flowers that need energy to grow and to breed, these leaves open up when the flowers do, since they are in there in the bud with them, and they pop out along with the flowers, and would provide sugars just a short distance away, and at the right time. It’s expensive to ship sugar around a tree, as it takes energy to move things, and so doing it locally, right next to the inflorescence, instead of having the leaves come up some distance away and transporting the food that some distance, it would just simply be more efficient to do it closeby. By having the leaves right next to the flowers, the source right next to the sink, this would save precious time and energy, always a valuable set of resources, but resources even more valuable in the spring, just after the trees have woken up and are drawing down their stored energy supplies, supplies that they packed away last year and have only in limited amounts. And by having those leaves right there in the bud, good timing is assured – no need to wait for the leaves farther away to open up (which they will later) when you have your own right there in the package with you. And so those little tufts of leaves at the bases of the inflorescences are quite likely feeding their neighboring buds and blooms. And also, those leaves could be beneficial to the tree by drawing up water, pulling it towards the flowers, who need to drink, too. The way that water moves up a tree is, basically, that the water evaporates from the leaves through little holes, called stomata; this evaporation draws the water up through tiny pipes, called, collectively, xylem, in a somewhat similar way to how water goes up through a straw when you draw on it as it sits in your waterglass. In fact, you can see how this works by taking a drinking straw and putting it entirely underwater so it fills with water, then taking a piece of a cotton ball and jamming it tightly into one end of the straw and then taking the entire contraption up and out into the air. Then, place it, cottonball end up, into a glass with more water in it, but this time with water that has a little bit of food coloring in it. Then wait. Or just come back later. Either way, after a while, you’ll see the dyed water migrating up through the straw, ultimately dying the cotton ball whatever color you have chosen from your pack of food dye, that you used to stain the water in which the straw is sitting. This illustrates, essentially, how water moves through a tree – the water evaporates from the leaf (in our experiment, that’s analogized by the cotton ball), which pulls it through the xylem (the straw, in our table top set up), which in turn pulls the water out of the soil (which is represented by the glass that holds the tinted water). And so, if leaves are situated next to the flowers of the inflorescence, which they are in the case of the Callery pear, then they would be drawing up water, water that could be shared with the petals and the sepals, the anthers and the stigmata, the parts that are the hopes and dreams for the next generation of trees. But whyever they are there, the fact remains that those leaves are there, and they are here and there throughout Philadelphia, along streets and in parks, pretty much in every neighborhood. But how did they, and their accompanying trees, get here to Philadelphia? The Callery pear tree is originally from east Asia, and since trees can’t walk, and nor can they swim, they had to have had some help in getting to North America, and their main agent of dispersal, the organism who got the seeds of the Callery pear to the new world, was Frank Meyer. Frank Meyer was a Dutchman, and he was also a botanist. Towards the end of the 19th century, Meyer worked as the head gardener in the experimental garden at the Amsterdam Botanical Garden, but this wasn’t enough to satisfy his yearnings for travel and his love of plants, and so he came to America in 1901, where he soon began to work for the US Department of Agriculture as a plant explorer. One of his missions, towards the end of his career, was to collect the Callery pear. And then, some decades after that initial delivery of seeds by Frank Meyer, USDA researchers in the 1950s noted that the Callery pear also had nice flowers and this, combined with its resistance to environmental stress, meant that the Callery pear was realized to be a tough and attractive street tree, and it rapidly became extremely popular, which is why we see it all over Philadelphia. But it most likely wasn’t just the tree itself that led it to be so widely planted. The timing of this work was probably key, also, to the widespread spread of the Callery pear. These trees, the Callery pears, came in and replaced, in part, the American elm – the American elm was the premier tree of parks and streets and so many other landscapes throughout the US, up until the midpart of the 20th century. Its vaselike structure, with branches growing up and out, made for tremendous arboreal arches that gracefully covered many streets in small towns, and big cities, and other places, too, until the Dutch elm disease knocked out this elm, and many others like it, taking it out of commission as the street tree of choice, requiring a replacement, many replacements actually, to fill the elm’s ample metaphorical shoes. 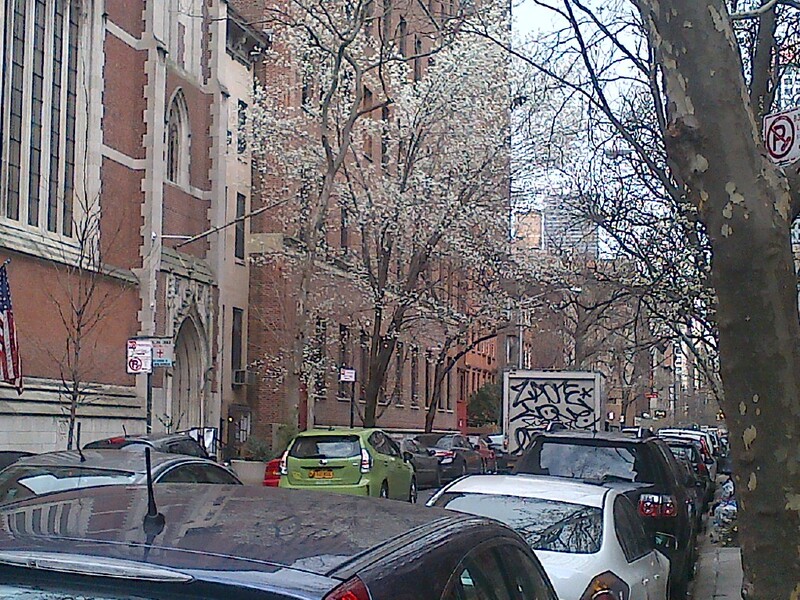 The Callery pear was one of those trees, and it became extremely popular starting in the 1960s as a tree for the street habitat, a niche that had been opened up by the Dutch elm disease. If you see a row of Callery pears, what you’ll often notice (I know that I do) is that they frequently will all have a spraylike branching pattern, where the trunk will grow nice and straight up until about 4 or 5 or 6 feet or so, and then there will be a division of that upright axis, where branches will grow angled outwards, kind of like an upside down broom. You might think that this is very thoughtful of the tree, to make such an eyepleasing design at about eye level, reminiscent of the form of the American elm. However, plants don’t think, or at least I don’t think they do, and this shapely pattern is due to the hands of man. If you cut the top off a tree, it generally will not die. It will however, grow quite differently than it would if it had not been decapitated. Branches that were formerly suppressed by hormonal signals sent out from that top leading growing tip can now grow, and they do – and sometimes all at once. This is what happens with the Callery pear. If the top of the tree is removed, you then get a spray like pattern to the branches that grow to replace that lost top. And so, if you walk down a street, for example, 19th Street alongside the Academy of Natural Sciences, just below Logan Circle, you’ll see that at about shoulder height, the branches of the Callery pears begin to spread, and you’ll know that at some point in time, someone walked among those trees, cutting them at an easy height to reach, about shoulder height, to make those Callery pear branches angle like they do now, an angle reminiscent of an American elm. People don’t plant Callery pears quite so often anymore – their branches tend to break, and there are concerns about its invasiveness. This tree, which is one of the few major introductions of the 20th century to our street tree flora has had its time in the sun. It was introduced, it had a population boom, and now we will see where it will go in the future, what part it will take among the street trees of Philadelphia and elsewhere. Posted on March 13, 2012 by David H.
All around Philadelphia, and in many other cities as well, the streets are lined with London Plane trees. These trees, with their trunks of exfoliating bark making them look to be covered in military camouflage, are recognizable from a hundred yards away. Or so I used to think, until I looked closely at the confusion and complexity that surrounds this seemingly simple and so common tree. The London Plane is of hybrid origin – it is the offspring of two different species, the American sycamore (Platanus occidentalis) and the Oriental plane (Platanus orientalis), and it is a tree that did not exist prior to European colonization of the new world. Before then, American sycamores and Oriental planes were kept separate by an ocean (the Atlantic if you’re going east from the US, or the Pacific if you want to go all the way around the other way), and they didn’t come together until the 17th century, when John Tradescant the Younger, a botanist and gardener (as was his father – John Tradescant the Elder, that is), came to the colonies in the early part of that century and in 1636 took the American sycamore to England. There were also Oriental planes in England at that time (they’re originally from the more eastern parts of Europe), however though the geographic distances that had previously kept the orientalis and occidentalis separate were gone, still for some time after 1636 age differences would have maintained that separation, as it takes time for trees to grow, and to make flowers, and to shed pollen, and to make new seeds for new plants. And so for some time these different plants, though now together after having been so long separated, would still have remained distinct from one another. By 1700, though, east had met west. We know this because in that year Leonard Plukenet, yet another English botanist, described an intermediate between the Platanus species that were already known (i.e., orientalis and occidentalis), and so from this we can infer that the London plane had arisen by then, an intermediate that looked like what it was, a hybrid cross of two morphologically distinct species. How, when, where and why this happened, we do not know exactly, except that it was in England in the latter part of the 17th century (the latter part because it would have had to have been long enough after 1636 to have allowed for the seeds Tradescant brought back to have grown into seed bearing trees themselves). Other than that, we can’t say with more detail, with any confidence at least, when this hybridization event occurred. It also isn’t clear when this hybrid, the London plane, came to the US (or one could say semi came back to the US, since half its genetics is from the new world) and to understand why, you have to understand the plants. London planes look quite a bit like their parent species, as you might expect, since that’s how genetics works (like begets like), and so it can be difficult to differentiate them. This is something I learned recently – I had thought for years it was easy to tell them apart, to differentiate the London plane from the American sycamore. But, as with so many things, I realized that the closer I looked, the more complicated it became. There are, broadly speaking, four main characters that are useful for telling these trees apart, the London plane and the American sycamore. Two of those characters involve the bark. On London planes, the military camouflage appearance mentioned above, in the first paragraph, is found up and down the trunk of the tree – on American sycamores, the bark is thick and rough up most of the main trunk of the tree, only exfoliating (peeling away) further up. And American sycamores generally have a white, and commonly bone-white, tone to the underbark that is exposed from the peeling away of the outer bark layers, while the London plane’s underbark will have a yellow or green tinge (or sometimes even a salmon orange color, as is found on a tree in Pastorius Park in Germantown, here in Philadelphia). The leaves also differ – the leaves of both trees are lobed, and in the London plane, the center lobe is longer that it is wide, whereas the sycamore’s is generally wider than it is long. A final character separates the two – the flowers (and then later, of course, the fruits) are borne on dangling peduncles (what we might call “stems” in normal English), and in American sycamores these are borne singly, while on the London plane they hang in twos and threes. Something else also differentiates these trees – their habitats. If you’re in the floodplain of a river or creek and you see a tree that looks like an American sycamore, it probably is. If you’re on a city street, and you see a tree that looks like a London plane, it most likely is. London planes are phenomenally sturdy street trees – they’re called “London planes” because they are and were so common throughout London, and while yes this is due to their attractiveness, it’s also because they were able to grow in the soot filled air of 19th century cities, and so became exceedingly popular, especially in London with its thick industrial era atmosphere. 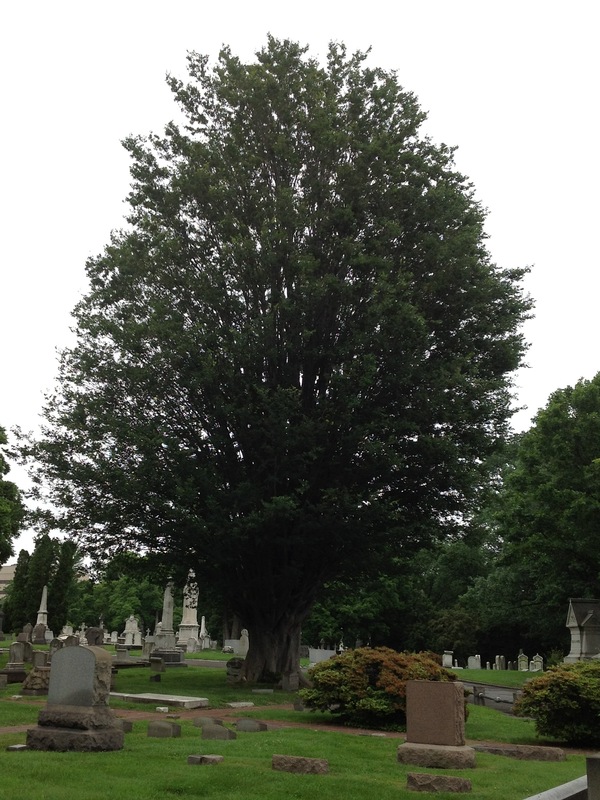 Since its introduction to urban life, this tree has had times of peak interest, and times of reduced interest, as is noted in William Flemer III’s article “Island and Median-Strip Planting”, in Arnoldia [vol. 44(4), pp, 14-28 (Fall 1984)]: “The London plane tree has gone through several cycles of popularity and disapproval. Many years ago a few nurserymen grew the trees from seed that produced great variation in habit of growth and disease resistance and this may be one cause for the disapproval. Another may be the plane tree’s vulnerability to canker stain disease, a serious condition spread by pruning tools or other mechanical means. The severity of the disease once led the city of Philadelphia to enact ordinances that prohibited planting the tree.” But, I should add, even though the London plane has had its ups and downs in popularity, it still, generally, will do better in an urban environment than the American sycamore will. This habitat differentiation is noticeable if you go to the Powell house on 5th Street in downtown Philadelphia – there is a London plane planted right next to an American sycamore. The London plane is doing quite well, happy as can be – the sycamore, much less so. Another habitat in which one seems to often encounter American sycamores is graveyards. There’s an enormous sycamore in Greenwood Cemetery, in Frankford, and another one in the churchyard/graveyard of St. James the Lesser, which is up near Laurel Hill Cemetery – there’s also some planted in the Palmer Burial Ground in Fishtown, and quite a few planted in West Laurel Hill, just over the city’s border, in Bala Cynwyd; there’s also an enormous one in the Germantown Friends burial ground that you can see easily and clearly from Germantown Ave, if you’re standing just a bit west of Coulter St.; there’s also one in the Friends Meeting House yard at 4th and Arch – there used to be a cemetery there, too. [there’s also a very large American sycamore at the Germantown Cricket Club, next to the parking lot] The symbolism of this makes sense, planting sycamores in Christian cemeteries. In the gospels, e.g., in Luke 19, when Jesus is going through Jericho, Zacheus, the chief tax collector in town, climbs what is called a sycamore to see Jesus as he is walking by – Jesus sees Zacheus up in the tree and calls to him, and Zacheus then “received him joyously”, as it says in the King James Version. Now, this tree from the bible is said to have most likely been a sycamore fig, and certainly was not the sycamore that we have in the US, but the symbolism, one might imagine, would still work and would be effective, because in a graveyard in which the dead await the return of the messiah, one would want a tree for them to climb up on Jesus’s return, so they can see him, and perhaps more importantly, be seen by him. American sycamores can also grow to enormous size – in the early part of the 20th century, the American Genetic Association put out a call for photos of and associated data for the largest trees in America. They published results of this in 1919, in the Journal of Heredity, and the largest tree by far was an American sycamore in Worthington, Indiana – it was 42 1/4 feet in circumference. London planes can grow quite large, but I’m not aware of any that come close to that kind of size. However, even though there are a number of differences between these plants, it can still be difficult to tell them apart. Why? Because even though the London plane is of hybrid origin, it still makes viable seeds, and those seeds are enormously variable, because they contain the genetics of both the parent species, in every combination available. Also, the London plane can back cross with its parent species, thereby further mixing up the characters. And so, many of the trees I see in Philadelphia that I once would have easily called “London plane”, I’ve come to notice often have a mix of the characters with those of American sycamore – and so separating them isn’t so easy. And even the plant’s name is confused and confusing. The latin name most commonly used for the London plane is Platanus x acerifolia (the “x” indicates its hybrid status), however, another valid name is Platanus x hybrida – this confusion arises because we don’t know which name, hybrida or acerifolia, came first, we don’t know which was assigned before the other. This is important to botanical taxonomists (i.e., people who name plants) because sometimes a plant is named more than once; for example if someone thinks they’ve discovered a new species, and they describe it and name it, but it turns out that they just didn’t know that someone else had named it before, well that first name that was applied previously is the one that is supposed to be used, and not the later one. This often simplifies things because the choice is based simply and solely on date of publication of the name of the species. However, it’s not always easy to figure that out, and this is one of those cases – while we know that both of these names for the London plane were assigned in 1805 (hybrida by Félix Brotero, a Portuguese botanist, and acerifolia by Carl Willdenow, a botanist in Berin), we don’t know exactly when within that year these names were used, and so priority is confused, and so are we. And there are further questions of nomenclature here – due to the backcrossing with the parent species, and because plants grown from seeds that are progeny of a hybrid are not, strictly speaking, hybrids themselves, it furthermore becomes complicated as to whether or not many of the London planes we see should truly be called hybrids, and therefore include that little “x” in there. The confusion doesn’t end there. Due to that Brotero name, “hybrida“, one might think that the hybrid origin of the London plane was clear and understood early on, or at least by the earliest part of the 19th century. But even this wasn’t clarified until much later, in 1919, when Augustine Henry and Margaret Flood thoughtfully marshaled the evidence – intermediate morphology that is between the two parent species, highly variable seeds that show traits of both parent species in various combinations – in a paper in the Proceedings of the Irish Royal Academy that clearly indicate that yes, the London plane is a hybrid of the trees from two continents. So perhaps the confusion does end there, at least for that one question, and at least for now. Posted on February 28, 2012 by David H.
One of the goals of Growing History is to propagate plants from historic sites, and to then share those plants among places with historic, cultural or horticultural significance, or just simply with places and people who love plants and history. There were 37 different such elms offered in the 1917 catalog, and they were mostly from England, from sites associated with the upper class such as high end schools (e.g, Oxford, Harrow, Eton) and other kinds of places like that, including Windsor Castle and Westminster Palace. Preserved for us on canvas by Benjamin West in his famous painting, “Penn’s Treaty With the Indians,” now hanging in Independence Hall. When blown down by a storm on March 3, 1810, its circumference was twenty-four feet, its main branch one hundred fifty feet in length and its ring count showed its age to be 283 years. Dr. Benjamin Rush had an armchair made from its wood. General Simcoe, during the Revolution, when firewood was scarce, placed a guard of British soldiers around the tree to protect it from the axe. 1. North of College Hall on the campus of the University of Pennsylvania, planted on April 10, 1896, by Governor Hastings. 2. South of Founder’s Hall on the campus at Haverford College. 5. In front of Johnson Library, Camden, N. J. This seedling was carried in her apron by a nurse from Shackamaxon to Elizabeth Cooper, who with her two brothers built and gave Cooper Hospital to the city of Camden. When the land where the Treaty Elm had stood came into the possession of General Paul A. Oliver’s ancestors, a shoot was discovered springing up from the old tree’s roots. This was transplanted to Bay Ridge, N.Y., where it flourished until after fifty years it had almost reached the size of the parent tree. Then the General removed it to his home at Wilkes-Barre Penn., where it has continued to thrive. On Arbor Day, April 10, 1896, a shoot from General Oliver’s tree was planted on the campus of the University of Pennsylvania Philadelphia, by Governor Hastings of that State, in honor of William Penn, first Governor of the Commonwealth. The tiny sapling grew into a healthy tree which has rounded out its first quarter century. It is one of the youngest of the Great Elm’s descendants. And so, if we follow Wildman’s and Nicholson’s histories, the Treaty elms that were sold in Meehan’s catalog had first made a detour to Bay Ridge, and ultimately ended up for sale back home, here in Philadelphia. These Penn Treaty elms were $8 each for the 1 inchers and $5 a piece for the half inchers. (The elms from England were 10 each, by the way). We don’t know what became of these trees, nor how many were sold and to whom they were sold – as of now, all we have is this record of the listings from Meehan’s Nursery catalogs (there’s a similar listing in the 1916 catalog), a record of an early 20th century interest in historic plants, and an attempt to make some commercial value from that. The nursery was founded in 1854 by Thomas Meehan, who is quite a historical figure himself – in addition to developing his enormously successful eponymous nursery, he was also a founding member of the Philadelphia Botanical Club, a Philadelphia City Councilman, an avid developer of city parks throughout Philadelphia, the rediscoverer of the pink dogwood, and a correspondent of Charles Darwin, Asa Gray, and other luminaries of the 19th century. And prior to his arrival in the US in 1848, he’d led an interesting life as well; as Edwin C. Jellett writes in his 1914 book Germantown Gardens and Gardeners, “Thomas Meehan was a Chartist, therefore a marked man, and finding it impossible to hold a position in England, he decided to emigrate to Pennsylvania”. Thomas Meehan died in 1901 and the nursery was then run by other members of his family. It closed in the 1920s, and shortly thereafter a housing development was built where the nursery once stood. Today, if you walk up E. Phil Ellena Street or E. Hortter Street, from Chew Avenue, under the oaks that were planted when the development was built, you are on the grounds of what was once one of the major nurseries in eastern North America. And Meehan’s is linked further and deeper into horticultural history. Prior to his many accomplishments, at the start of his career, Thomas Meehan was a gardener at Bartram’s Garden. In the late 1840s, soon after he came to the US from England, he worked as a gardener there. This relationship comes around again in the 1890s, after Meehan had made his fortune as a nurseryman and become a politically influential member of the Philadelphia community, when he fronted the movement to keep Bartram’s Garden as a garden, thereby preventing it from becoming built upon by developers. And so, nothing is new. Today, we propagate historic plants, and we find that Meehan’s Nursery did that nearly a hundred years ago. Today, those of us who are interested in gardens and natural history spend time with others who feel the same, and we want to preserve the historic sites that are key to these interests. And, as we do today, Thomas Meehan linked sites and institutions in the 19th century and worked to preserve them. And so, nothing is new.